Hazel Blears MP got in an early plug this morning on the Today Programme for a speech she is giving this evening (remember when news was reported only after something had happened?). However, she was speaking of the sound notion that by improving communication and understanding we can reduce misplaced beliefs that some things we say, or do, will be offensive to other communities. When asked if Irish, English, Scottish jokes are OK, she struggled a bit. Who wouldn’t? It depends on context, intent etc, on which it’s nigh on impossible to be certain, let alone to legislate. Now, off down a tangent. What is funny? Answer: anything that makes us laugh. Is it possible to laugh at something we shouldn’t? Answer: of course it is. ‘How dare he?’ said Billy Connolly, when hearing a fellow comedian list a number of issues that he deemed as ‘off limits’. The Big Yin had a point. Take just one of the myriad subjects about which we would not wish to hear jokes and then tell us a joke about it. If we find it funny, then it is. We may be ashamed of ourselves moments later but our immediate reaction can’t always be considered and our ‘appropriateness filter’ may not be in place in time to stop a smile. To claim that something offensive cannot be funny is nonsense. However, it can be wrong. And if it is, we must be prepared for the social or legal sanctions that follow. In the meantime, the rightness or wrongness of ‘English, Irish, Scottish jokes, won’t prevent them from being found funny; and saying ‘it was only a joke’ will never be an excuse for hurting others. Does charity begin at home? During a BBC radio discussion yesterday on whether UK troops should be in Afghanistan, Nicky Campbell summed up the position of those opposing intervention with the term, ‘Charity begins at home’. This diverted me from the weighty issue at hand to consider what we mean by this convenient aphorism. I soon realised that it is a call not to begin giving at home but but to stop giving to those who are not ‘at home’. It’s distinctly uncharitable. When Terence first uttered the phrase in the second century BC, he was underpinning Rome’s famous lack of charity for others. Fair enough. Looking after our own is a primary obligation and one with which we willingly comply because it matches natural motivation and feels right. But this isn’t charity; it’s self-interest. • “Love of humankind” – nothing about ‘only of our own kind’. So, what outcomes from these brief musings? The first is a belated realisation that ‘charity begins at home’ is oxymoronic, because charity can’t exist once we raise the drawbridge on those who are outside ‘home’. The second is that when I next say, ‘no’ (as I often do) to a charitable request or impulse, I’ll choose more appropriate words. And I’d like to think that the Samaritan didn’t cross over to help the injured stranger because it would make him a Good Samaritan but because he knew that charity didn’t begin on his side of the road. Among the (too) many ‘how to write books’ I’ve read, an ever-present piece of advice – sometimes offered harshly, sometimes gently – warns writers against showing their work to, or readily accepting the views of family and friends. Reasonable advice once we’re under way, by which time, hopefully, we’re leavening their comments with expert advice on what’s needed if we’re to stand a chance of being published. But what about at the beginning? When we had just a rough first chapter, the vaguest outline, or one or two ‘good bits’ that might work up into something? When those close to us were putting up with our anxiety and frustration, listening one day to our doubts, the next to our excitement? When we were asking ourselves ‘who do I think I am to be writing a novel?’ Or feeling embarrassment at mentioning it? Or being afraid to commit? So, if you’re finally getting down to writing that novel, play, short story or poem, there’s time enough for objective assessment. Until you’re ready for it – and you must get ready – go on inhale the oxygen-rich support of loved ones. Of course, when you’ve finally something to show an agent or publisher, don’t say that ‘my mother and my wife/husband love it.’ But don’t you dare forget that they do, and that they loved it at the beginning when no one else did. If they hadn’t, the professionals might never have got to see what you’ve written. This post was prompted by a long-into-the-night conversation at an Arvon ‘Starting to Write’ course in which some of us revealed we’d been given the final push to attend not by writers, teachers or books, but by family and friends. After a barbed suggestion that the Saying I love you post signalled ‘grumpy old man’ – like that bit of beard missed when shaving – I was further impaled this morning by this (daily Google quotes), ‘The second half of a man’s life is made up of nothing but the habits he has acquired during the first half.’ Dostoevsky. Oh dear. There is a gravity of ageing. If not resisted, it carries us deeper into the familiar and comfortable collection of our polished, chrome-hard views, and away from the new and the unknown. What to do? Well, I won’t be abandoning strongly held views without a fight. But I do recognise hardening of the attitudes as an age-related condition that, like cholesterol levels, must be monitored closely. No one wants wimpy ‘I dunno, what do you think?’ responses to questions, but I will try to get better at waiting for the question before offering my amazing experience. Such a bleak image from another time brought to mind a story told me by Graham Lancaster, leading communications professional and author of several novels, to illustrate the difference words can make. 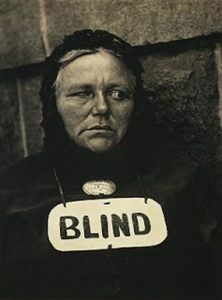 A blind man at a street corner was shaking a tin cup into which few people were dropping coins. On a slate board around his neck, he had chalked, Blind. One passer-by asked if he might add something to his sign. The blind man agreed and handed over his chalk. The passer-by wrote on the slate and left. Photo: Paul Strand. Blind. 1916. Metropolitan Museum of Art, New York. I’ve been thinking, possibly too much, about saying, ‘I love you’. According to hints from those who know they’re my loved ones, I don’t do it enough; say it aloud, that is. I’m not sure I want to. How often is enough? My Joda reply – that ‘say’ may be important but so is ‘do’ – doesn’t get me off the hook. Anyway, if I am saying it too rarely, a dismaying number of people are making up for me. Everyone’s at it: on the train, at the school gate, on the phone, in TV dramas. At every temporary parting (it’s probably OK if you’re about to fly to Australia or sail around the world single-handedly) someone is telling someone that they love him or her. ‘I love you’ is losing its identity through being wrapped ever more tightly around ‘goodbye’, as in, ‘bye, I love you’. Or it’s being replaced altogether: witness, daily, the waved hand followed by, ‘love yoo’, often chanted without a backward glance at the object of this most perfect sentiment. I don’t doubt that those beating ‘I love you’ to death do love those to whom they say it. I do doubt the need to say it ALL THE TIME. Drowning each other in daily doses of it, degrades a wonderful sentence (where it is a complete sentence) into something prosaic and trivial. The phenomenon is related, in an era of positive affirmation, to our tendency to reach straightaway for a superlative when describing the merely good or nice. ‘Oh, it’s the most beautiful thing I’ve ever seen’ about a welcome (or not so welcome) gift. But what do you say when presented with something that is the most beautiful thing you’ve ever seen? Worn out superlatives won’t be up to the job. I digress. When 14 February comes along, I wonder if turning ‘I love you’ into daily gabble, along with ‘whatever’ and its ilk, could kill the joy of Valentine’s Day itself. Think of youngsters – the most highly exposed recipients of this quotidian term of farewell – when opening Valentine’s cards that say, ‘I love you’. How will they know whether they’re being dumped, or their admirers actually love them? Familiarity breeds… etc. Receiving the most potent message in the English language several times a day weakens its impact; and if ever a message was meant to have impact it’s ‘I love you’. Do we need to fear for its power even when whispered in the personal, intimate situations that it normally electrifies? Hope not. ‘I love you’: the most beautiful words we can hear. Let’s keep them for best. I’ll be a frequent visitor to PotD but, on this occasion, I’d challenge the assessment of its jury. Some exposition in the ‘Thought’ could be described as platitudinous; the same could be said of most broadcasts – and blogs. However, Anne Atkins’ core message, that love and care for children is infinitely more important than possessions, hit home because it has the merit of being true. A loved, well-fed baby held safely in its mother’s or father’s arms doesn’t care whether it is looking up at a rusting corrugated ceiling or a chandelier. It has, for the time being, all it needs. Among the imperatives of parenting – and there are so many – this is one on which we should never give up. Many ‘yes buts’ come readily to mind, not least those relating to fairness and society’s priorities for children. There are other important truths; but they don’t negate the prime importance of the one expressed by Anne Atkins. One of thousands of ‘gardens in the snow’ pictures that will appear on blogs today. No one ever accused me of being original. Has there ever been more intelligent, more insightful, more beautifully written travel writing (although it’s much more than a travelogue) than West’s?